The school which opened in 1875 as a Board School was opposite the railway station, seen here above the school. To the left of the station is Cockden Mill. 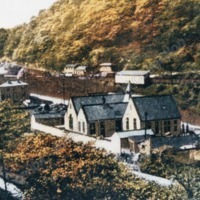 The school closed in 1946 and was subsequently demolished. Cockden was the industrial area of Eastwood and Cockden Mill, known as Dan Crabtree's, was west of the station. The typical L&YR station name board is on the right. 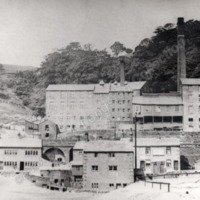 The mill was demolished late 1950s/early 60s by when derelict.